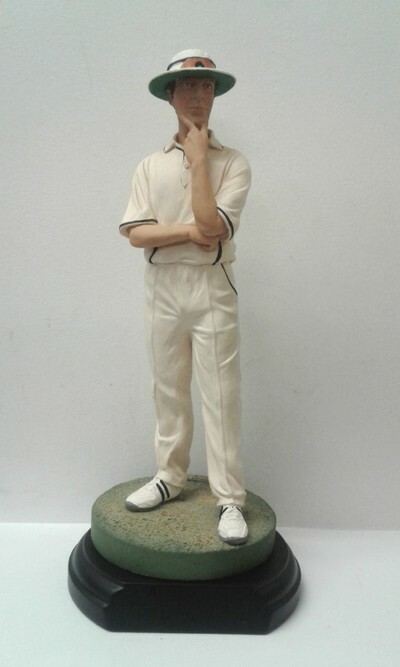 A superb figurine of Cricketing legend, Michael Vaughan. Michael Paul Vaughan OBE is a former English cricketer, who played all forms of the game and a former English captain in all formats. He represented Yorkshire in the domestic arena.Vaughan captained England in 51 Tests between 2003 and 2008, winning 26 (a national record) and losing 11; England won all seven home Tests of the 2004 summer under Vaughan, and the pinnacle of his captaincy career came with a 2–1 victory in the 2005 Ashes, England's first Ashes victory since 1986/87.